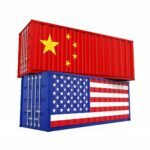 Imposing tariffs on $50 billion in Chinese goods with one-for-one Chinese retaliation will shave one-fifteenth of a point off GDP and cost 100,000 jobs by 2019; manageable. Imposing tariffs on $450 billion, as Trump’s suggesting, would have substantive negative economic impacts, and China might retaliate by devaluing its currency — as China only imports $130 billion/year from the US — to offset weaker export growth. The US could then similarly retaliate. Yikes.